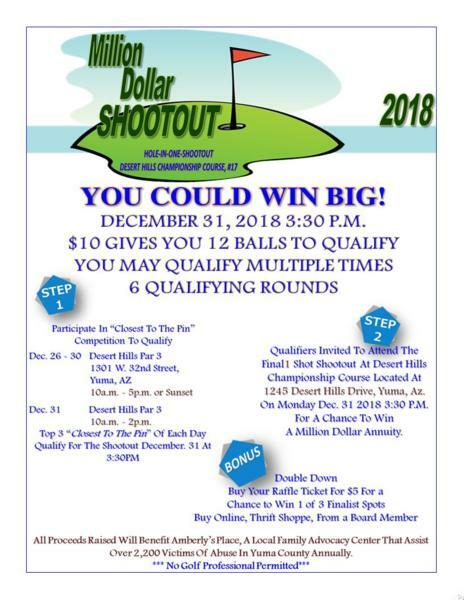 DECEMBER 31, 2018 3:30 P.M.
Dec. 31, Desert Hills Par 3, 10a.m. - 2p.m. Qualifiers Invited To Attend The Final1 Shot Shootout At Desert Hills Championship Course Located At 1245 Desert Hills Drive, Yuma, Az. On Monday Dec. 31 2018 3:30 P.M. For A Chance To Win A Million Dollar Annuity.